Rare Aircraft – Baby Mil: The Mi-34 Training Helicopter | Achtung, Skyhawk! It seems to be a rule of nature that every former Yugoslav airbase still in use today has a few hidden gems with which to tempt the photo finger – even among the locals who were used to seeing them on a regular basis. Croatia’s Zagreb (ZAG/LDZA) has its large MiG-21/Mi-24 graveyard; Serbia’s Batajnica (LYBT) has a bewildering mix of Soviet and indigenous combat and transport machinery that cannot be seen anywhere else in the world; while Macedonia’s Skopje (SKP/LWSK) can boast what are likely Europe’s last non-preserved Su-25s – and very definitely its only Israeli-modified Mi-24s. And Bosnia’s Sarajevo? Well, that has a Rajlovac Helicopter Base and one of the rarest series-produced helicopters on the planet – Mil’s diminutive Mi-34. It’s not the most beautiful whirlybird out there, nor is it the most representative… but its rarity was well worth the five hour drive here! As the early 80s dawned, the helicopter industry of the USSR was slowly – but surely – beginning to feel the adverse effects of the Soviet leadership’s single-minded preoccupation with heavy machinery. With 20/20 hindsight, it is not really hard to see why: the exploits of the Mi-24 during the First Afghan War had clearly shown the value of the helicopter gunship, while the stalwart Mi-8 was proving – day in, day out – its ability to reach even the more distant backwoods of the Union. Then there were the impressive Mi-6 and Mi-10 for when you needed to move stuff, and Kamov’s ungainly – but supremely capable – Ka-25 and 27 families to keep the fleets safe from Yankee subs. Everywhere you looked, there was a shiny and mighty medium/heavy helicopter doing its bit to keep the system going and its citizens safe & (somewhat) content. At the same time, the people who would go on to fly these things were being trained on archaic machinery such as the 50s Mi-1, which – while solid and dependable – were relics of the early days of Soviet helicopter design, and could in no way prepare pilots for the rigors of operating out on the front lines. As was also the case in the fixed-wing sector, learning to fly a helicopter in those days was essentially like stepping out of a Mach 0.1 Po-2 biplane and straight into a Mach 2.0 MiG-21 – with depressingly predictable results. Having realized at two minutes to midnight that this problem needed to be addressed ASAP, the powers that be eventually ordered Mil to get itself into gear and start developing an all-new multipurpose light helicopter that could be used equally well for training, competition, transport and liaison – as well as potentially exported internationally even outside the traditional Soviet customer base. The definition of this new machine was also influenced by the successes of the Aerospatiale Gazelle and MBB Bo.105, since one of the key requirements was a proper, no-nonsense aerobatic capability – and not just a willingness to be thrown about inherent to most other training helicopters. 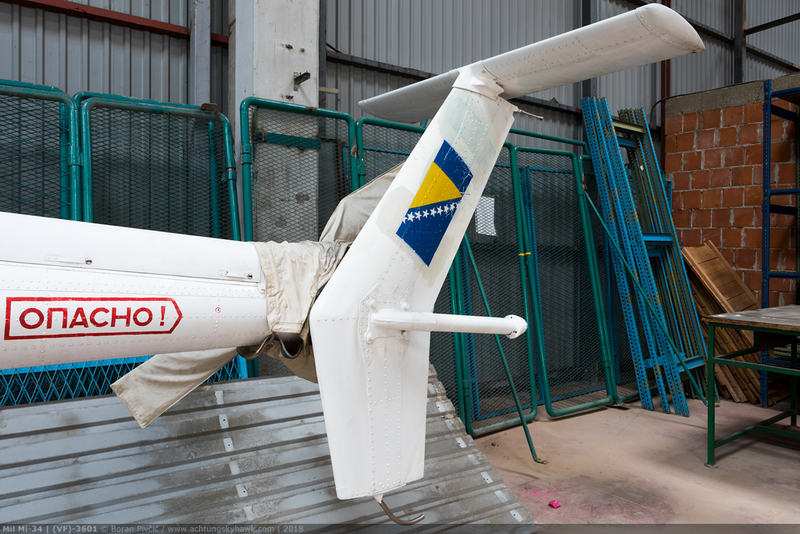 At the same time, it also had to have a benign and forgiving nature, informative and precise controls – and flight characteristics that would enable students to get the most out of the experience without scaring them half to death. But, while the Mil works certainly did have the expertise and industrial capability to pull this off and pull it off cleanly, by the point they’d finally gotten round to it, time was no longer on their side. By the mid 80s – when detailed design got under way – the signs of the USSR’s impending collapse were becoming more and more apparent, and the financing pipelines from Moscow more and more constricted. Faced with a tightening purse, the government’s own procrastination and the Soviet aerospace sector’s general R&D inertia, Mil had suddenly found itself under mounting pressure to do the new helicopter as cheaply and cheerfully as possible while still satisfying what is even today a demanding set of specs – and then getting the thing into the air with a minimum of fuss. As it stood at the dawn of the 90s, the basic four-seat Mi-34 did however have some things going for it. Despite being Mil’s smallest helicopter design since the Mi-1, the 34 did manage to punch some way above its weight, sporting an advanced glass-fiber-reinforced rotor system dominated by a very capable four-blade semi-articulated main rotor (actuated mechanically, without powered boost). This setup had allowed for outstanding agility with maneuvers such as loops and rolls, flight at +3/-0.5 G (impressive figures for a helicopter), a yaw rate of 120º per second (head-turning even today), as well as the ability to reach 140 km/h flying backwards – all of which were firsts for any helicopter ever made in the USSR. Aside from its outright dynamic capabilities, the 34 was still a proper Mil – so it was as tough as nails – and its projected price was low enough to offset (at least for a while) most of its aerodynamic or mechanical inefficiencies, as well as its rather crude finish and lack of refinement inside. Though it looks like the result of a three-way between a Gazelle, MD-500 and JetRanger, the Mi-34 does have a certain (if brutish) elegance. Though the rear cabin doors seem small, the interior is pretty spacious – though it does suffer from a lack of glazing compared to most Western helicopters. 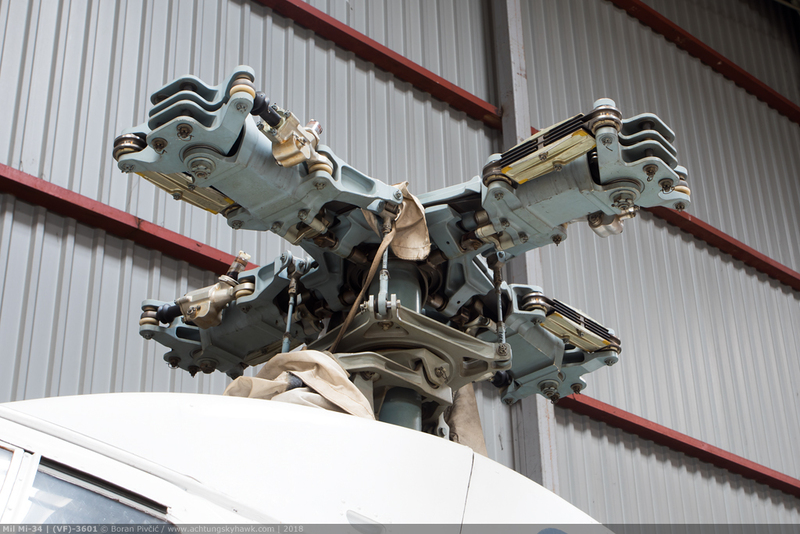 Though it doesn’t look quite right, the absence of blades at least shows well the construction details of the -34’s main rotor head. While not the most sophisticated or efficient rotor system around, the semi-articulated setup (also used on the Gazelle) combines low weight, simplicity of production and easy maintenance with light, crisp and fast control feel and response – exactly what you need when you don’t plan on doing much flying in a straight line. The MD500-style rear end is pretty conventional as well, with the transmission for the tail rotor running atop the tail boom and enclosed within a protective fairing – a pretty common solution on most helicopters (interestingly, on the R-44 – the most similar machine out there – the transmission is fully enclosed in the boom itself). A detail that can hardly escape the eye is the prong sticking out of the fin, which actually houses the rear navigation light. But, while all of the bits on the outside were where you’d expect to find them, under the skin things were a bit less straightforward. Alongside its antiquated avionics setup – the eternal Achilles’ heel of all Soviet designs – the 34 was immediately let down by the only engine it had readily available, the 330 HP Vedeneyev (VMP) M14V-12V nine cylinder radial. While a superlative powerplant known in song and story for its bulletproof reliability, the M14* was nevertheless a heavier, thirstier, more maintenance-intensive and far less efficient solution than even the flat six of the 34’s closest rival – the 1991 Robinson R-44 – let alone the mighty turbines of the Gazelle, Bo.105 and JetRanger (which, admittedly, cost up to for times as much as an entire Mi-34: USD 2 mil for the JetRanger’s Allison 250 vs 500,000 – in today’s money – for a complete Hermit). Coupled with a 600 hour Time Between Overhauls (TBO) that fell woefully short of the 1,500-2,000 hour figures seen westwards, these issues seemed set to limit the Mi-34 appeal long before it even flew. * while very much a 1950s product – an old school, supercharged, carburetted, 10 liter mass of Russian metal – the M14 did have some plus points however… but only in a specific corner of the Mi-34’s envelope. Its lack of refinement and cruising efficiency was more than made up for by its capabilities during aerobatics, delivering high torque, world-renowned durability when being pushed hard, and a lightning-fast throttle response that no turbine before or since could match. Critically, its shape allowed it to be mounted upright in the fuselage, which in turn made it possible to set it right onto the 34’s CG sweet spot. This in particular did wonders for maneuverability, since it all but eliminated the adverse moments experienced when the engine has to be mounted away from the center of lift – as well as reduced stress on the airframe during high G flight by minimizing the engine’s moment arm. 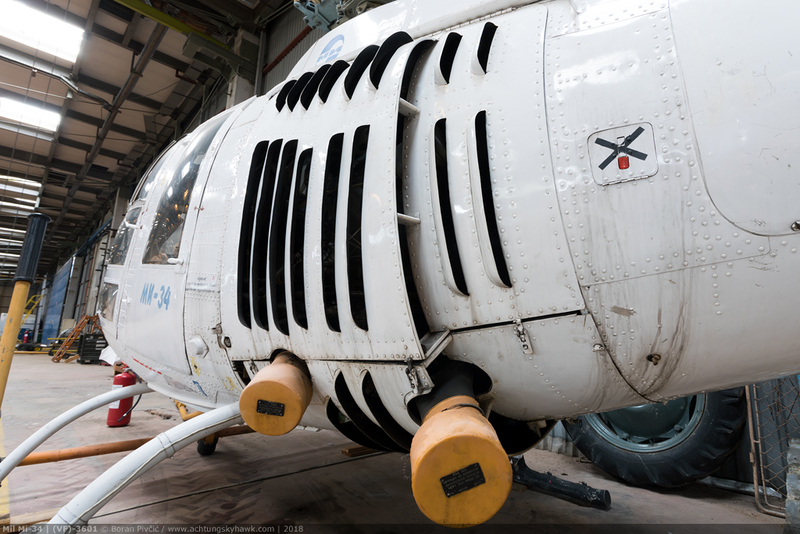 The most distinctive visual feature of the Mi-34, the engine cowl gives hint at the type of engine hiding behind it. While placing such a large and heavy mass immediately behind the rear seats did wonders for the Hermit’s dynamic behavior, it had made life on board pretty grim, with reports of high noise and vibration levels that were on par with early generation helicopters. A peek under the hood nicely shows the unusual positioning of the engine – sideways and at a slight angle, which must not have been very popular with maintenance staff. Apart from reducing unwanted moments to a minimum, this approach also allowed for better cooling of the engine – especially during aerobatics and hover – by exposing its entire frontal area to the sideways flow of air through the cowl. This was further assisted by a large cooling fan, one of whose blades can be seen between the oil cooler and No. 2 magneto (the two right-most silver cylinders). The engineers at Mil were, naturally, well aware of this straight from the outset, so even before test flying of the prototypes had ended in the late 80s they began looking into other – if less easily obtainable – engine options. 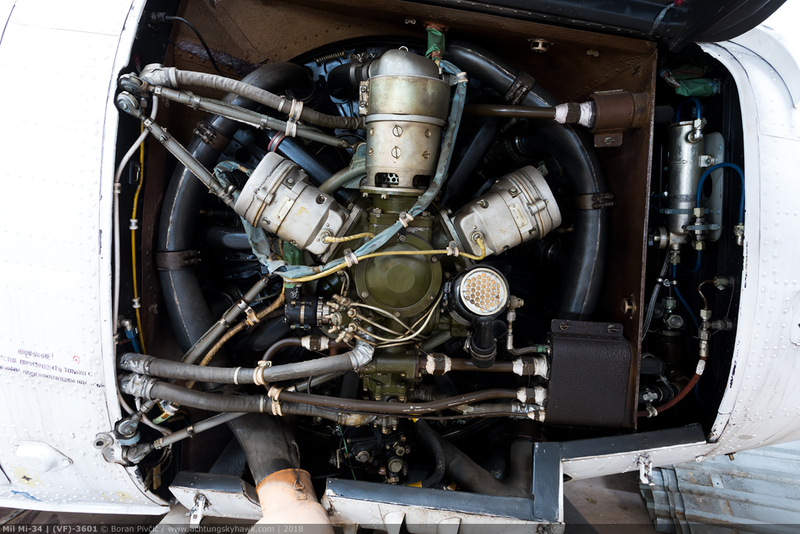 Their first choice (and the most cost-effective from a design standpoint) was the Lycoming TIO-540-J six cylinder boxer unit, whose turbocharger and fuel injection were good for 360 HP at takeoff. Dubbed the Mi-34L, this model would have brought the Hermit more on par with the later R-44 – but was, sadly, torpedoed before getting off the drawing board by the dissolution of the USSR. And while import of these engines would have likely been made possible even then, the increased costs for the end user – as well as the lack of support infrastructure within the (ex) Union – represented a pretty strong set of nails in the L’s coffin. Meanwhile, the loss of the first prototype during a test flight on 27 February 1989 – attributed to deficiencies in its rotor system – had forced Mil into a quick-and-dirty redesign, the result of which was the Mi-34S, the type’s first production-standard model. 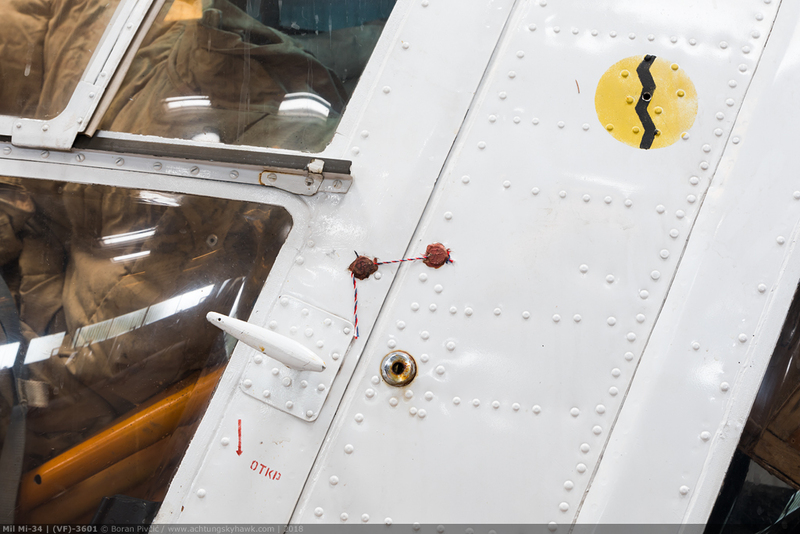 As well as the necessary improvements to the main rotor, the S would also receive a redesigned (and more extensively glazed) nose, as well as avionics and equipment upgrades that made it possible to certify it to Russia’s new AP-27 standard in May 1995. 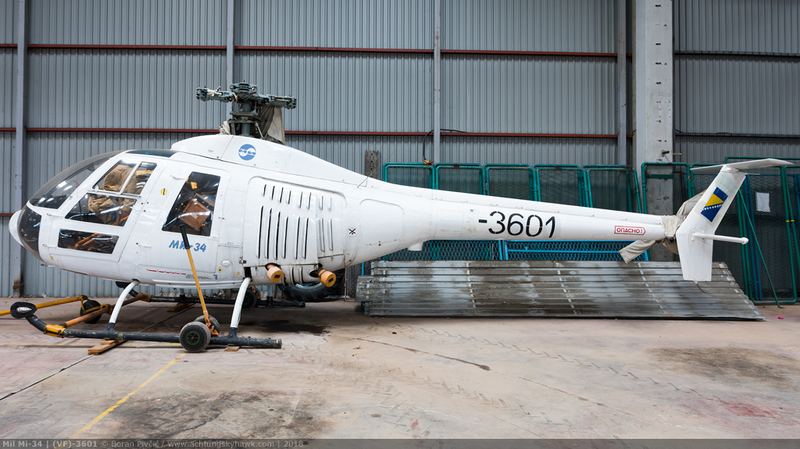 Broadly similar to the FAA’s FAR-27 governing Normal Category Rotorcraft, a fully satisfied AP-27 had soon opened the legal doors to further international certification, worldwide export and widespread commercial use – the stuff of dreams for Mil’s by-then-exasperated sales team. Back on the engine front, it would take the company’s next attempt – made in 1993 – to show just how desperate the engineering team was to replace (or at least supplement) the big M14. Called the Mi-34VAZ (or Mi-234 in some sources), this model was to be powered by twin rotary/Wankel VAZ-430 engines running on standard automotive gasoline and developing 230 HP each along the way. A modification of the VAZ-4132 unit used in police versions of the Lada Riva and Samara, the 430s gave a significant payload (and noticeable performance) boost – but their low TBO, expensive maintenance and prodigious fuel and oil consumption quickly turned the -34VAZ into just another paper helicopter. A noteworthy tweak intended for this variant was also an all-new carbon fiber rotor head, which would have improved on the (already improved) fully composite setup of the standard S – but there are, however, no indications whether it was ever carried forward onto any future versions. Their third crack at it – the more down-to-earth Mi-34A – would be made just two years later in 1995, and had, at the time, promised to finally unleash the full potential of the design by switching to turbine power. However, since there were no indigenous engines of sufficiently low a power and small enough a size available, the A would be based on the same 450 HP Allison 250-C20R as the JetRanger III, fed now from an enlarged 340 liter fuel tank (up from the standard 176) necessary to cater for the turbine’s higher thirst. Sporting an upmarket interior now aimed more at Russia’s growing upper class than traditional flight schools, the A would never make it beyond the mock-up stage, having ended up as another casualty of Russia’s very fragile post-Union financials (not to mention the increasing influx of more user-friendly helicopters from the West). Interestingly, a second turbine attempt would be made more than a decade later in 2008 with the Mi-34S2 Sapsan (later marketed as the Mi-34AS), powered by the 515 HP Turbomeca Arrius 2F** used on Europe’s best-selling EC-135 and A.109 families – as well as Russia’s own Ka-226T (in the form of the Arrius 2G1). Unlike the old Mi-34A, the S2 had come into being during a much milder economic climate, so it had even made it to the flying prototype stage before nosediving into the dirt. While it had shown a lot of promise as a cheap high-performance utility machine (with 56% more power – and shedloads more torque – than the basic S), the Sapsan would be shot down by none other than Mil’s parent company Russian Helicopters, which had in the early 2010s partnered with AgustaWestland for work on a brand new – and much improved – design of the two-ton class. ** some sources state that Mil had also planned to offer the S2/AS with the option of the Ukrainian Ivchenko-Progress AI-450 unit developing 465 HP – a move that would have likely made the Mi-34 hugely appealing on the (very large) CIS market. However, recent… “political developments” down there mean that this idea is very firmly in toilet for the foreseeable future. Of further interest, the AI-450 was developed during the mid 90s (’94 onwards to be exact) to power the original Ka-226 – and was in fact the first small, relatively modern gas turbine to be designed in the lands of the former USSR. The only other “baby turboprop” fielded anywhere in the ex-Eastern Bloc was Czechoslovakia’s Walter M601 of the mid 70s – which was never considered for the Mi-34, since even its lowest 710 HP output far exceeded all of the Hermit’s needs. With the turbine 34 now down for the count, the only way to salvage the time and effort invested was to keep beavering away at the piston model. Mil’s first (stillborn) attempt at it was the Mi-34SM, a simple upgrade of the basic S that would have seen its M14V-12V replaced by the 380 HP M14V-26V, fitted now with fuel and oil systems for inverted flight and boasting a TBO increase to nearly 2,500 hours. The rising popularity of the R-44 in Russia – and the SM’s predicted inferiority in many respects – had however soon forced Mil to shelve this idea and concentrate instead on the much-improved Mi-34S1, powered by the far more potent 365 HP VMP M9FV***. The new powerplant also came packaged with a redesigned main rotor and an all-new gearbox, both of which had proved to be recurring problem areas on the standard S (despite their 1989 post-crash rework). The S1 would also become the first Mi-34 to feature hydraulically operated flight controls (with the actuating systems supplied by Goodrich of the USA), since the non-boosted controls of the classic S had shown themselves to be pretty tiring during prolonged aerobatics or long-range flight. The list of new features would also include a revised internal structure to prolong service life, and would be topped off by an avionics upgrade that had even included some digital avionics – though it is not clear from available sources whether the setup would be indigenous or sourced from the West. *** the first significant update of the M14 since its introduction, the M9F was designed by the Voronezh Mechanical Plant (VMP) – the people who actually built the M14 – and was intended to power the stillborn Su-49 primary trainer. 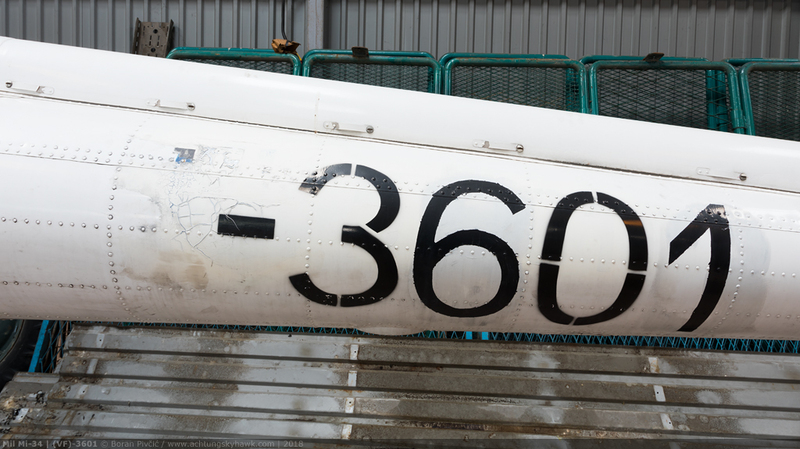 A development of the bog-standard Su-29, the 49 would have used hydraulics for actuating the landing gear rather than the traditional Soviet pneumatic setup, the result of which was the addition of a hydraulic pump to the back of the engine case. Other smaller upgrades had included a redesign supercharger for a bit of extra power, three powerful magnetos for better ignition – and in fixed-wing uses (such as on the few Su-26M3s actually made) new propeller mounts to accommodate the German-made MTV-3 and -9 units instead of the standard V-530 shipped with the M14. Interestingly, the Su-49 design had stipulated a power requirement of around 450 HP, which was be achieved by switching to fuel injection, creating the M9FS. However, no Russian-made fuel injection system had been available then, forcing the idea to be scrapped – since the 49’s primary customer, the Russian Air Force, wanted to keep things in-country as much as possible. Of further interest, the V suffix appended to both the M14 and M9 is short for “vertolet” – or helicopter in Russian – and indicates models adapted to rotary use in which there is no gearbox integral to the engine (as on the fixed-wing versions), but where power is sent to the main rotor gearbox directly using a transmission system. Flying for the first time in prototype form on 4 August 2011, the Mi-34S1 had quickly shown the potential of being a reasonable R-44 alternative within Russia – but, sadly, still fell far short of being its rival everywhere else. The performance figures had once again highlighted the deficiencies of the radial engine, for despite commanding 120 HP more than the R-44 (365 vs 245 at maximum take-off power), the Mi-34 could cruise only 12 km/h faster (220 vs 202) and fly only a tiny bit higher (14,700 ft vs 14,000). At the same time, it was significantly fatter than the Raven (1,150 kg empty vs 683), carried 33% less payload (330 kg vs 450), hovered outside the ground effect at under half the altitude (3,500 ft vs 7,500) – and could fly 100 km less (450 km vs 550) despite being able to carry 60% more fuel (176 l vs 111). The fuel flow figures too were not that great, with figures of 18-19 GPH being reported in the cruise – noticeably higher than the 15-16 of the R-44. And then there was its family curse. Right at about that time, the Russian Air Force had decided to pass up the Su-49 in favor of the less complicated Yak-152, which would have retained the traditional M14 and pneumatic installation of its predecessor, the Yak-52. This had, at a stroke, made the M9F redundant, leading VMP to rehash its production plans and abandon the design in favor of further tweaking the M14. The Mi-34 had thus, once again, been left up the creek and without an engine. As the Mil works scrambled once more towards the West in search of a replacement engine, the 34’s fortunes continued to turn for the worse, since its continual delays, the inability to enter any form of meaningful series production and a lack of international certification (despite the promise of the AP-27) began to wear quite thin with potential customers – both civilian and military. Though UTAir (one of Russia’s largest helicopter operators) and Omsk Aviation Training (one of its bigger helicopter schools) placed orders for 10 each in the early 2010s, the decisive blow would once again come from the Russian AF, which had – having grown tired with waiting for the “domestic solution” to be ready – awarded its highly coveted 100-strong training helicopter contract to Eurocopter and its turbine AS.350 single and AS.355 twin. Another version that had almost made it big was the Mi-34UT, a different, S-based dual control variant pitched to the Russian AF for its first 100-strong training helicopter tender in 2001. 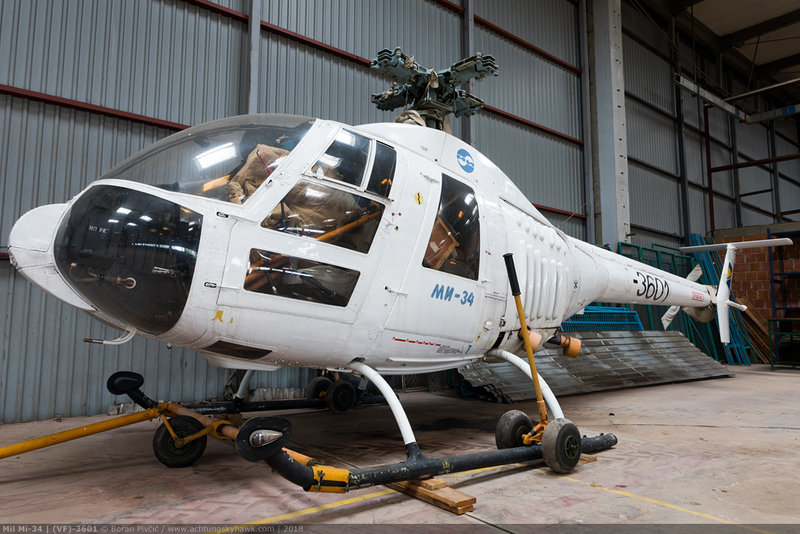 Like the unnamed S1-based model that had sealed the Hermit’s fate, the UT would also come up short compared to the competition – in this instance Kazan Helicopter’s Ansat turbine single, designed by the very factory that produced most of Mil’s transport helicopters. **** some sources indicate that there may have been other versions under consideration, such as the Mi-44, powered by the OMKB TV-O-100 turboshaft originally developed for the first Ka-226 – and the Mi-34M, a twin-engine six-seat development similar to the AS.355. However, both of these are mentioned only in two places and nowhere else – so given the absence of concrete evidence of their existence, I have excluded them from further consideration. To add insult to injury, the government’s cold shoulder (twice over) would turn out to be just the tip of an iceberg. Despite its undoubted qualities (especially in the aerobatic role), the 34 would in service suffer from chronic “sovietness”, with a low service life, questionable dispatch reliability and appalling after-sales support that quickly undid any good impressions it made. The largest single operator of the type – the Nigerian Air Force – would be left with a particularly sour taste in its mouth, with all of its nine S models (all delivered from Mil stocks in 2002) suffering rotor gearbox failures soon after passing the 300 hour mark – despite the manufacturer’s claimed 1,500 hour TBO. Being uneconomical to run – let alone repair – the fleet would be permanently grounded and stored after just a few years, their only movement being the 2013 sale of six examples to a private buyer from New Zealand (where five have been reported cannibalized in an attempt to return No. 6 to airworthy state). From that point on, the bad luck just kept on piling. The aforementioned “lifeline” orders from UTAir and Omsk came to naught due to the downturn of the whole program, while the few other operators who flew them – mostly governmental – began retiring their small fleets soon after due to difficulties in obtaining spares and support. While various production lists are either incomplete or give inconsistent information about the 34’s current and past operators, all point to the fact that Mil’s long-hoped-for sales break westwards ran out of steam already on the Balkans, with three examples sold to Romania and one (featured here) to Bosnia – a total of just four machines shifted in non-Soviet Europe. Despite its dismal failure to break into the international market (even within the Soviet sphere of influence), the Mi-34 is actually not really a stranger to the Balkans. Its first contact with the region would come in 1996, when Mil pitched it to the Croatian Air Force – a long-time Mi-8 and 24 user through its origins in the Yugoslav Air Force – which was at the time looking for a training machine with which to equip its newly formed helicopter training squadron. To that end, one Mi-34S was actually sent to the ZTZ maintenance facility adjacent to Zagreb Airport to fly demo flights for the military; but, despite having left a solid impression, the type would stumble here as well, losing out to the more-well-rounded (and better supported) JetRanger III (still in use today). If correct, this would make it an original (pre-S) model – and only the fifth 34 ever produced (not counting the prototypes). This interpretation appears to be backed up by info I’d received at Rajlovac, stating that this machine is part of the type’s “null series” – in local parlance the name of any post-prototype, pre-series production batch. Part of this status is reflected even in its military code, with VF standing for “Vojska Federacije” – or the Army of the Federation of Bosnia and Herzegovina, one of several military entities operating in the country following the 90s civil war. All of these entities would merge together in the early 2000s, leading to some… complicated and legally unusual situations, such as this one. As always I would like to extend my very sincere thanks to the PR department of the Bosnian Ministry of Defense for its assistance in organizing this visit – and especially all the staff at Rajlovac Helicopter Base in Sarajevo for their hospitality! Author’s note: the information presented above is the result of my own research into multiple sources (listed below), each of which had presented only part of the Mi-34 story – with possible inaccuracies and urban myths as a result. I have tried, to the best of my abilities, to filter and stitch them into a meaningful and representative whole – but given the type’s small production run and lack of much concrete info from primary sources (such as Mil themselves, who I had contacted without reply), I cannot vouch that this work is the whole truth and nothing but the truth… so if any of my readers have more info – or spot an error – I would be more than happy to hear from them! Thanks for an enjoyable read Boran, liked your writing style 😊. Was considering a Mil-34 to convert to turbine for agricultural flight ops here in NZ, but after reading your article, perhaps the Ka-26T may be a better option?